Large fields of millet, milo, and unharvested winter wheat draw birds from several counties, making a Chain Ranch dove hunt unlike anything you've experienced this side of Mexico. If you're looking to entertain clients or just hoping for an afternoon away with your hunting buddies, this is the perfect hunt. Groups of up to fifty hunters are welcome. 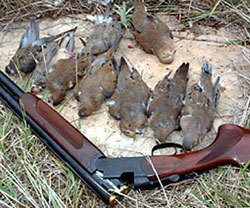 Half day hunts are $125 per person. This includes transportation to and from the field, pre-placed blinds in the fields, bird cleaning and packaging following the hunt. Overnight accommodations are available for an additional $50 per person. Let us plan your entire corporate event, from the hunting to the chuck wagon cookouts!